It has now turned out that the monster President Muhammdau Buhari failed to destroy is becoming his nemesis. For a president, who coasted to power on the promise of change, I had watched the inexperience at democratic governance or naivety exhibited by Mr. Buhari when he thought he was boasting, saying that he was not interested in who emerged as leaders of the legislature. “There is due process for the selection of leaders of the National Assembly and I will not interfere in that process … I am prepared to work with any leaders that the House or Senate selects….It doesn’t matter who the person is or where he or she is from,” Buhari had said in a statement signed by Malam Garba Shehu, then Director Media & Publicity APC Presidential Campaign. Buhari’s stance then had dethroned logic. How could a president say he is careless about who controlled an arm of government that has the power to rubbish his presidency or even cut his reign to pieces with the sword of impeachment? Then I wrote in my blog : “Sir, If you wanted to show statesmanship when you refused to influence who emerged leaders of the National Assembly, you only ended up displaying naivety. It is common practice, even in civilized democracies, for a president or prime minister to influence directly or indirectly who emerges as speaker of parliament. “You promised change and should know that you are no longer a dictator. It therefore means that you need good laws to deliver on your promise. Now how can you effect change with a man like Bukola Saraki as Senate President? How could a man who is one of the most people who profited from Nigeria the way it is, allow you to change the status-quo? 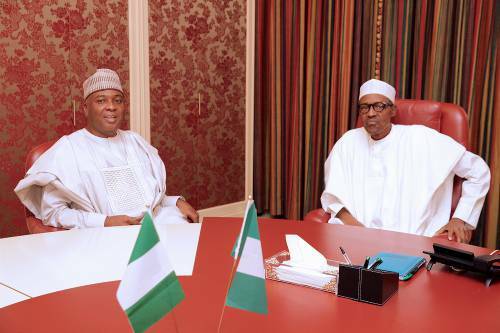 Buhari’s political naivety by allowing Saraki to emerge and remain as senate president is now his greatest undoing. As things stand, the two men from the same ruling party, APC, are chasing different goals. Nothing shows that the ruling party has a commanding majority of the two houses of parliament. It has become increasingly embarrassing for the president in his failure to get simple bills passed or his appointees easily endorsed by the legislature controlled by his party. The case of Mr. Ibrahim Magu, Acting Chairman, Economic and Financial Crimes Commission (EFCC) stands out. Twice Buhari sent his name to senate for approval as substantive chairman and twice the Saraki-led Senate rejected him – on the flimsy excuse of a negative security report. Notwithstanding the fact that Magu has done fairly well as EFCC chairman. Though there is the accusation in some quarters that he is an apostle of selective justice. In any case, critics of the members of the National Assembly say they are hell scared of Magu, who in my assessment, has prosecuted an uncompromising war against corruption. Mr. Obasanjo, speaking at the public presentation of the autobiography of Justice Mustapha Akanbi in Abuja in 2014 said: “Apart from shrouding the remunerations of the National Assembly in opaqueness and without transparency, they indulge in extorting money from departments, contractors and ministries in two ways. He added: “Corruption in the National Assembly also includes what they call constituency projects which they give to their agents to execute but invariably, full payment is made with little or no job done. The truth is bitter. Whether the members of the National Assembly like it or not, majority of Nigerians, including this writer, share Obasanjo’s view. So like the mockers of the legislators say on social media, how can rats allow a cat (Magu) to become the anti-corruption czar? Ndume’s only sin was that, as a representative of a senatorial zone, he had called for the investigation of the allegations against the Senate President bothering on non payment of import duties on an SUV and certificate forgery leveled against Senator Dino Melaye, representing Kogi-West. Ndume could have made the demand for two good reasons. First, being a matter of public interest, Nigerians have the right to get to the bottom of the matter. And secondly, maybe, he wanted the two senators to be cleared of the accusation so as to preserve the integrity of the Senate – if there is still any left. The purported suspension of Ndume is the height of impunity by the Saraki-led Senate. It is an infringement of the right of free speech of Mr. Ndume as a senator and that of the constituents he represents in the Senate. I will encourage him to seek legal redress. The Saraki-led Senate has been insulting Nigerians with its series of illegalities and pettiness. So much that the Chairman of the Presidential Advisory Committee Against Corruption, Prof. Itse Sagay (SAN) described the senators as being childish and irresponsible. In this era of summoning anyone and everyone, even for merely coughing, the Senators have also summoned the learned jurist. The Nigerian Senate under Saraki has lately become a source of embarrassment to Nigerians. Sagay was so miffed with the behavior of the lawmakers that he wondered how people of such character could occupy the highest legislative office in the country? “Nigeria is finished,” he concluded. I heap the blame on Buhari. He failed to take control, as the leader of the ruling party, from the beginning. And, up till now, he is still not in control. Going back to Magu for example, if Buhari had been in control, the so-called DSS negative security report on Magu would have first being seen by him before it gets to the legislature. Unless, he is playing a game of chase with Magu. Saraki was the monster Buhari failed to destroy politically when it was rearing its ugly head and when it was politically expedient. Now the monster has gone full circle and destroying everything in sight – its maker not spared, talk less of those who tolerated it. Also not spared is whatever is left of Buhari’s change agenda. It has also become a big threat to our democracy.